Developed by American scientists in the mid-1980s, silver-glass adhesives are a potential substitute for gold-silicon eutectic, as they have high thermal conductivity and a coefficient of thermal expansion (TCE) close to that of silicon. Silver-glass has been evaluated for the manufacture of power hybrids and for attaching active devices with gold or silver back metallization to substrates plated with nickel or silver-plated copper. A number of military and space customers now use silver-loaded glasses for die attach since the TCE reduces the stress in the package. A typical silver-glass paste contains 80-85% by weight of silver flake and lead borate glass dispersed in an epoxy-resin-based system. The paste is dispensed into the package cavity, the die placed on the paste, and the package inserted in a furnace. The heat removes the organic vehicle and then centers the residual solder and glass to bond the die strongly to the ceramic. The material should form a smooth fillet free of voids and cracks. To achieve this, the conventional process includes a pre-drying step of 2-10 hours at 60-80°C, depending on die size. Sufficient solvent needs to be eliminated to avoid the formation of voids, and the void density depends on the drying temperature. However, too high a drying temperature can reduce shear strength because there is no intimate contact between die and glass. Optimized conditions should yield voids less than 1%. Several researchers have determined this level of voiding experimentally using radiographic techniques. The figure below illustrates the sequence of events that happen to silver glass paste during firing. 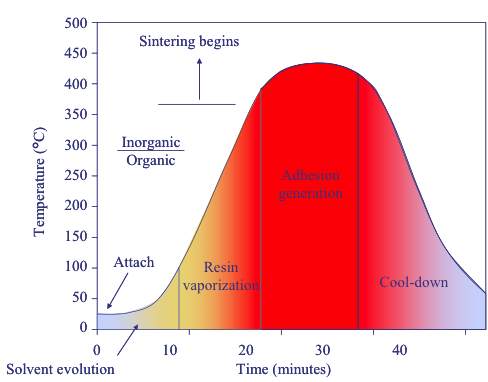 Solvent evaporation (50-200°C) is followed by polymer resin burn-out (300°C). The glass starts to soften at 340°C, which causes silver-glass sintering to accelerate and further wet the surfaces of die and substrate. Reaction bonding of silver-glass with silicon and alumina also starts at about 340°C, and the reaction is completed when the temperature has been maintained at 410-430°C for approximately 10 minutes. Figure 1, Firing profile for silver glass. The shear strength of the material increases with sintering temperature towards an asymptotic value, probably due to the densification of silver particles. Therefore, one must take into account degradation mechanisms on the die. For example, too high of a temperature can cause aluminum to silicon ohmic contacts to degrade. SEM observation shows that the attachment to the die is not continuous, that there is a high concentration of lead at the interface between the silver-glass and the substrate, and that adhesion seems to be the result of diffusion of silver into the gold layer. Researchers like Dequidt explained the absence of gold in the silicon and gold-silicon eutectic by the nickel or titanium under-layer preventing migration of gold into the silicon. Similarly, bonds between the silver glass and the plated package are probably interdiffusion mechanisms, whereas bonds between alumina and silver glass are chemical and similar to conventional thick film. In investigating the process, thermogravimetric analysis (TGA) is used to determine the temperature at which solvents are eliminated from the binder and differential thermal analysis (DFA) is used to characterize the glass and show its recrystallization. Stress relief for large area dice. A single pass firing process with no pre-drying. Precise rheology for high speed dispensing. As with resin attach, the TCE of the bonding material is not a significant factor in die stress. This assumes that the thickness and modulus of the die bonding material is small compared to the thickness and moduli of die and substrate. However, cracks due to thermally induced stresses arising from a TCE mismatch between silicon and ceramic have been reported by Nguyen for die larger than 10mm on a side. Furthermore, the bond line thickness has to exceed a minimum value for acceptable performance. The stress in the bonding material is related to the sintering behavior of the silver/lead borate glass mixture. Control of the sintering rate is typically achieved by small quantities (0.1-1%) of proprietary additives which increase the surface roughness and slow down regrouping of the particles. This helps to eliminate cracks without adversely impacting on adhesion and void formation. Despite the claim that silver-filled glass offers lower cost, faster processing, high yield, better thermal performance, and a lower die stress than gold-silicon eutectic, it has not replaced eutectic or other solders for high power chips. This seems to be because companies are reluctant to change. However, the material is widely used in the fabrication of Ceramic Dual Inline Packages because it resists the high temperature of the furnace sealing involved. Two types of mechanical cleaning methods are used in semiconductor wafer cleaning: ultrasonic and megasonic. Ultrasonic cleaning uses frequencies between ten and one hundred kilohertz. The generation and collapse of bubbles creates shockwaves that impact on the surface. The shockwaves can be effective in loosening and removing particles. Most ultrasonic techniques use either de-ionized water or a one-to-one acetone-ethanol mixture. Megasonic cleaning uses higher frequencies, typically between 700 kilohertz and 1 megahertz, hence the term megasonic. Megasonic cleaning is becoming more important since the higher frequencies generate smaller bubbles, creating smaller shockwaves, resulting in less surface damage. This technique is safer on fragile materials like low-K dielectrics. This is a cross-sectional view of a megasonic cleaning tank. 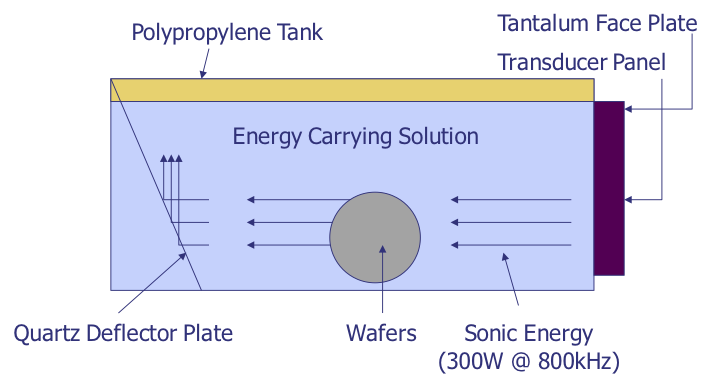 The transducer, responsible for generating the sonic energy, is on the right-hand-side. A typical energy for megasonic cleaning is 300 watts at 800 kilohertz. The wafers are placed parallel to the wave action. As the waves pass by, they interact with the surface removing particles. To prevent return wave action, a quartz deflector plate is placed at the left end to deflect the wave action to the surface. Figure 1, Configuration of Megasonic cleaning system. As the wave interacts with the particle, small shockwaves hit the particle. If we perform the megasonic clean in a solvent solution like acetone, the solvent can attack material that might be holding the particle impact. The combination of energy and chemical action speeds up the cleaning process. Q: I’ve heard that nitric and sulfuric acids behave differently with silicon/CMOS and GaAs technologies. Basically, one or the other acid destroys one (or the other) die. Do you know which acid is compatible with which die type? A: Sulfuric acid tends to be more of a problem with GaAs. There is an etch system based on Sulfuric-Hydrogen Peroxide-Water for GaAs. If you can keep any oxidizing agent away (and nitric might act as one in this case if you mix the two) then you shouldn't be etching the GaAs substrate at an appreciable rate with sulfuric acid. In my experience, the bigger problem is etching the metals on the die. Both sulfuric and nitric in conjunction with water will etch aluminum.